I've been busy. Taking care of these two precious boys. Over the last two months I've placed my focus on my growing family, after introducing my second son Barrett into the world. He surprised us by coming three weeks early, on the day after Christmas. A sweet Christmas present indeed! I am just fine and am all healed up from delivering this bundle of joy into our world, but I'm still adjusting to this new way of life. Things have changed for me in the crafting industry... I've stepped down from my place on the Studio Calico design team and I've decided to take a long break from designing stamps for Papertrey Ink. Stamp designing is a ton of work and I need this next year to focus on family first. I have every intention of returning to Papertrey Ink as an illustrator when the time is right. However, I am happily remaining on the Papertrey Ink senior design team and I'll be back to blogging my projects starting this March 1st. I look forward to getting inky again and sharing what I love with all of you. Just want to let you know, I cherish each and every one of you and thanks so much for bearing with me through this transition. They are both precious! LOVE that smile!! Congrats Maile!!! How exciting!!! You are missed, but I'm so glad to hear you have taken time off to be with your family! Congratulations, Maile!!! Both of your boys are super cute! And I think it's awesome that you're focusing on your family!!! What an amazing gift you are giving them!!! I have been wondering where you've been. Congratulations on your new bundle of joy. Your boys are adorable. I so understand on you wanting to take a break and focus on family and yet spend some time craft. Glad you're going to continue crafting even if it's just a teeny little bit as I do enjoy seeing your projects. The simplicity of your designs is close to my heart. Enjoy your boys and craft! Congratulations! Enjoy enjoy your time with the lil' ones!! Congratulations on the birth of Barrett. I'm glad you will still be showing your creations on the PTI DT. See you March 1st. Congratulations! Your boys are so cute! Congratulations on baby number 2:) Glad to hear you'll still be on the design team. Congratulations! Your sons both look adorable! I totally understand that you need to focus on your family! Glad to hear that you are still on the DT and we'll see your creations soon again! Recently placed my first order with Papertrey Ink and noticed that most of the stamp sets I ordered were designed by you! Love your style! What a sweet precious detour for you Maile! Barrett is adorable and with two boys I can totally understand why you are focusing on them, that's as it should be! I have missed your posts and can't wait to see what's coming in March. Congratulations!! Best wishes to you and your growing family. My son and daughter-in-law were blessed with a second son in early January. Their older son is 20 months. They are learning having two kids is a lot different than having one. Enjoy this special time. Congrats Maile! So glad that all is well with you and your new bundle of joy! His smile is infectious! Congratulations... Your boys are beautiful! Enjoy your time with them. I will be glad to see you in March. Congrats on your new addition to the family! Looks like you have two happy boys Maile! You are a wise mother in putting some things in your life on hold to enjoy every moment with your boys. They grow up in a blink of your eye. 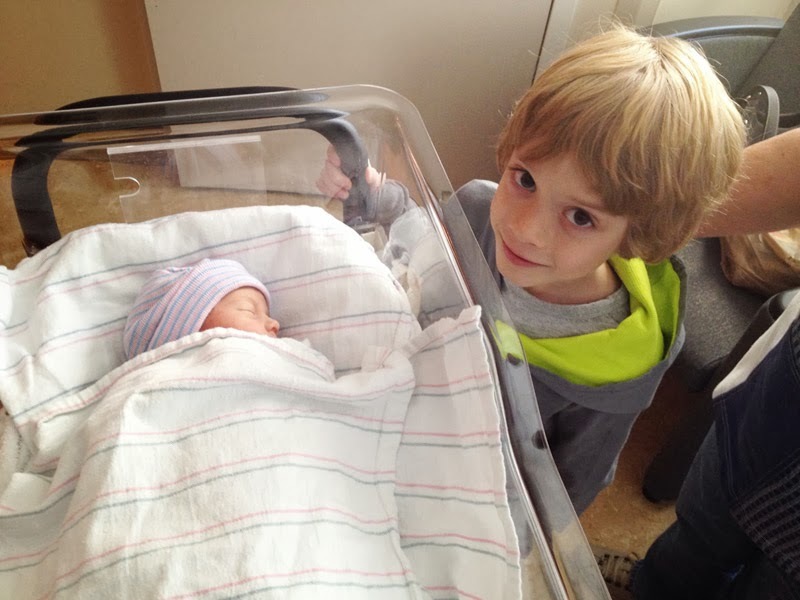 Congratulations Maile, the newborn and his brother are the best reasons to put your focus on the family! I´m so glad for you! Even though I missed and still miss your creative inspirations I wish you a wonderful time with your family! I really love your PTI stamp-line and the cards you create and I´m so happy that you remain in the DT Team!!! What a beautiful baby boy and big brother! I'll be glad to see your PTI creations again, and meanwhile enjoy your family time! Congratulations ! Your boys are adorable :) I love your work and will be waiting to see you back at it again ! So happy for you and your family! Enjoy the time. It's precious as is that smile! Congratulations, Maile, on the birth of your son Barrett. Looks like Big Brother is quite pleased, too, as he should be. You're a smart woman taking time for your family even though we truly missed you. Looking forward to seeing more of your lovely PTI creations on your blog. Welcome back! Congratulations!!! Maile. You are definitely choosing the right path! Design time can always be resumed. Baby time flies by so fast as it is.. Enjoy your days / minutes with your two as one day you will blink and wonder where the time went. !! I have 2 boys too… One left for college last year.. I swear it just seems like a couple years ago I was taking pictures like you just posted of Barrett.. Enjoy the moments. Congratulations to you all on your beautiful edition. What a wonderful smile, there is nothing in this world that can beat the feel of a baby laying close to your heart. Maile, congratulations on your new addition. Wow, your boys are beautiful. Life does fly by, so enjoy your time. I love your work, but family comes first. Hope you all are adjusting. Have a wonderful day. Maile, congratulations on this newest addition to your family. Both your boys are VERY handsome. Thank you so much for a peek into your busy live. Enjoy every moment, as they pass by much too fast. Congratulations! What a sweet, happy baby! I completely understand your decisions and respect them. Being a momma to two boys is super fun! Enjoy it and take as many pictures and videos as you can--you'll appreciate it later. As a newcomer to your blog may I say you have a beautiful family - both of your boys are very handsome - and Barrett already has a winning smile! Looking forward to reading more from you - but meanwhile enjoy this very special time in your life. Congratulations!!! Such cuties you have!! Enjoy your time with your family. Congratulations!! Your family is precious! Enjoy your time with them! They look both such sweet and cute boys!! Awww - what cuties - both of them. I miss your creative posts but family comes first. Congrats on the sweet addition to your beautiful family! Cherish your time with them! We will all be here when you return! Maille, you children are beautiful!! Your best creations! Enjoy your time with the family. I love your cards and stamp designs as well. Looking forward to your future creations. Congratulations to you and your family on the addition to your family. Both boys are so adorable. Enjoy your time with them. Looking forward to seeing your creations again. Congratulations, you won't regret the extra time you are taking to be with your precious little ones as the time goes by so quickly. I look forward to your creative posts when you are able. As it should be.....just don't give us withdrawals!! Congrats to your family on the adorable addition. Absolutely NO need to apologize for putting family first! Your decision was spot on - well done :) LOVE the pics of your smiling little guy - totally precious! Enjoy the time, it flies by! My "babies" are 13 and 15 now and I can't believe it! Congratulations- your photos are adorable. Glad you will be still working for PTI as you are super talented. Congratulations.... Such adorable boys. Oh my, precious baby smile. You are truly blessed. Congratulations! They are both precious. I totally understand, and applaud, your decision to put family first. I look forward to seeing your work again soon. Oh, Maile!!! Congratulations on your BEAUTIFUL baby!!! Your boys are adorable!!! Blessings to you all!!! Beautiful present & obviously big brother is so proud. Congrats & we'll look ahead to your future projects. Congratulations! They are both sweet little boys, but that smile is melting me :). Thank you for letting us know where you've been. I had a Dec. 26 baby too. Not my favorite Christmas Day, but my favorite 12/26. Then I had a 12/26 grandson, exactly 20 years later. Enjoy every (exhausting) minute. Focus on your sweet family!! You cannot get that time back but designing will be there when you are ready!! Enjoy and know you are missed! What an absolute cutie! Actually, they are both adorable. How lucky you are. I look forward to seeing your work again - I am one of your biggest fans. I love your clean, uncluttered, modern style! Oh Maile...I'm so happy for you! Barrett is just beautiful...his smile is just what I needed today...thank you! Congratulations! 2 cute kids--have a great year focusing on your family! Always enjoy your work, so glad you're staying on the PTI DT! They are just adorable--both of them! What a smart decision you've made. The days and years fly by. Today is my youngest's birthday---he turns 31! Congratulations! We'll be looking forward to the March release at PTI! I have missed seeing your beautiful projects. But you were busy working on the most beautiful of all! Congratulations and many blessings to your family. Congratulations and many blessings to your family and what a lovely smile makes your heart melt and I completly understand why you step back to enjoy your family. I have missed your beautiful projects but I am sure they will come back. For now just enjoy your family. Congrats on your new addition! What a cutie!!!! We really missed you and can't wait to see you back in action! Congratulations, Maile, to you and your husband. To paraphrase lyrics from Mumford & Sons: We will wait, we will wait for you! Your little Barrett's smile made me smile! Congratulations on his arrival. I respect your decision to spend more time with your precious family and I am also selfishly so excited to see more of your cards in March! You are a gifted designer. What a sweet baby and darling little boy - congrats to you and your lovely family! Thank you so much for sharing the delightful pics of your darling boys. What a smile your new little one has! So sweet. A big congrats & hugs to your whole family. So happy for you. OMG! Congratulations Maile to you and your family! I love Barrett's smile! Congratulations! What a wonderful Christmas present! Glad to see you focusing on what matters most. Congratulations! He is precious! I have missed you, but I absolutely agree with you that family (specially with little ones) is first! HUgs! Congratulations, dear Maile! Your boys are beautiful and so worth the changes you are making! Much love to you, my sweet friend! The biggest congratulations to you and your family Maile!